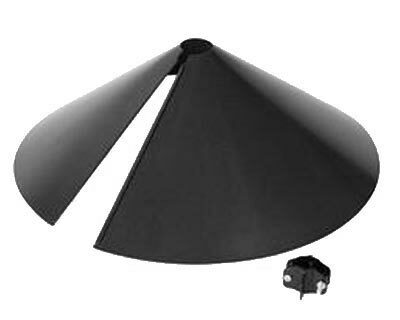 Stokes Squirrel Baffle, Black, 18" dia. The Stokes Black Squirrel Baffle features an innovative design that prevents squirrels from climbing bird poles to get to birdseed. The wrap-around design of this baffle allows you to attach it without disassembling your bird feeder or pole. This proven and practical accessory will keep your birds and their bird seed safe. The durable weather-resistant finish of the powder coating will maintain its classic black color and quality season after season. This unit fits the Stokes Bird Feeder Pole, Garden Hooks, square posts from 0.625" to 1", and poles measuring between 0.625" to 1.25" in diameter. When using post mount squirrel baffles, be sure your feeder pole and bird feeder are placed 10 to 12 feet from any low hanging tree branches or structural overhangs such as deck rails or buildings. Note: A portion of the proceeds from the sale of this product goes to bird habitat and conservation. Audubon Wrap-Around Squirrel Baffle, Black, 18" dia. Stokes Wrap-Around Squirrel Baffle, Black, 15" dia. Woodlink Wrap-Around Squirrel Baffler, Black, 13.5" dia.